Max and I went to the World of Outlaws World Finals last night. All night with my big boy. 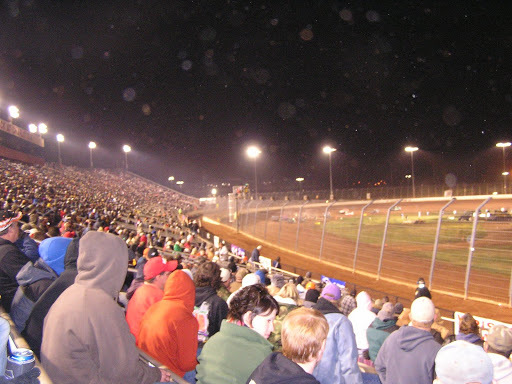 We have been to a couple of races together since moving to Charlotte, but this was our first trip to the Dirt Track at Lowe’s Motor Speedway. SO MUCH FUN! It was so incredibly cold, though. I mean COLD. So cold that I took my sweater off and put it on Max. He’s five. And adorable in dad’s sweater. About halfway through the evening, I looked down and realized he wasn’t wearing a sock on his right foot. He said he didn’t put one on because he “didn’t need it.” So I took my sock off and gave it to him. And my left foot was numb the rest of the evening. I love making memories with my Max! Fun night. A special thanks to Ray Bonis for hooking us up with the tickets!